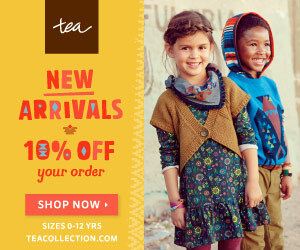 Tea Collection’s New Arrivals in Fashion Wear! Tea Collection has added New Arrivals from Patchwork Jungle of India to their collection of apparel. And they have even come out with new swimwear line too. Tea’s second set of new arrivals tell a story of jungle safaris from the heart of India. During their inspiration trip to India, Tea’s designers kept thinking of characters from “The Jungle Book” by Rudyard Kipling. As a result, you will find styles with familiar names, such as Bagheera the panther and Kaa the snake, in this collection. Wild jungle foliage graphics will be seen on many tees, dresses, pants and hats. These bold arrivals from the patchwork jungle of India will inspire every little citizen. In addition, Tea Collection has just released their brand new swimwear line. Receive free shipping on full-priced swimwear purchases! Tea’s new swim line is perfect for spring break vacations and getting little citizens ready for summer.